Bar shoes could be considered the foundation of therapeutic farriery. A bar shoe is one in which the heels are joined to form a continuous unit of steel or aluminum. There are several patterns of complete bar shoes commonly used in therapeutic farriery including the straight bar, the egg bar, the heart bar, the heart bar-egg bar (full support shoe) and the “Z’ bar shoe. 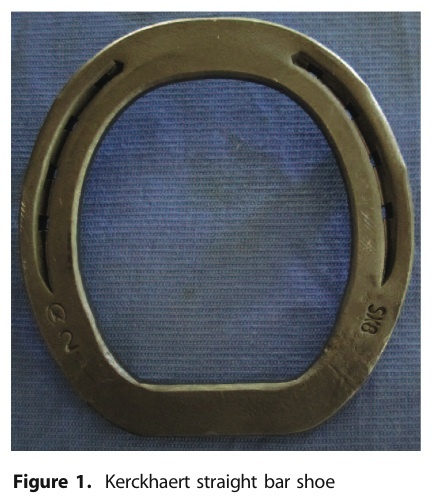 It is important to realize and understand the multitude of benefits a bar shoe can provide such as increased stability of the hoof capsule, increased ground contact surface, local protection and recruitment of additional weight bearing areas of the foot. Furthermore, they decrease the independent vertical movement of the heels and provide the ability to unload or support a section of the foot. 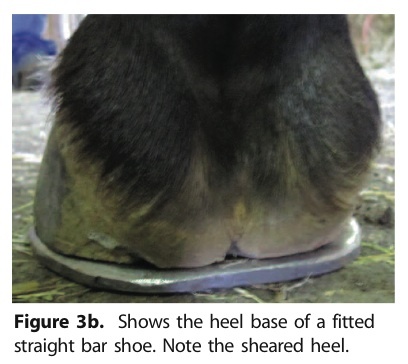 Placing a bar between the heels of a shoe adds several inches of surface area to the foot, thereby reducing movement and stabilizing the hoof capsule. 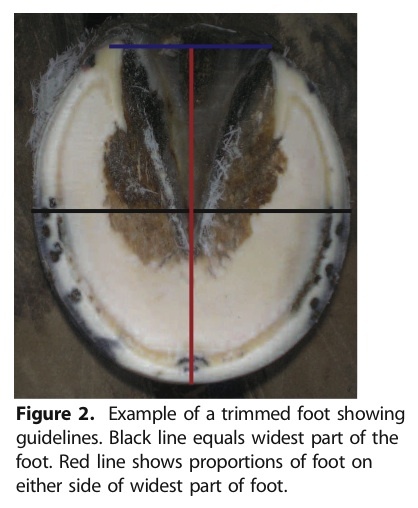 The additional ground contact surface also seems to prevent the palmar/plantar section of the hoof from sinking into deformable surfaces providing a “flotation” effect. This effect appears to be helpful when treating palmar foot pain as it seems to limit the extension of the distal interphalangeal joint during the impact phase of the stride. I use a tremendous amount of straight bar shoes in my practice. Historically, bar shoes had to be forged from bar stock or a bar had to be welded between the heels of the shoe but recently many types of well-designed bar shoes have become available commercially. 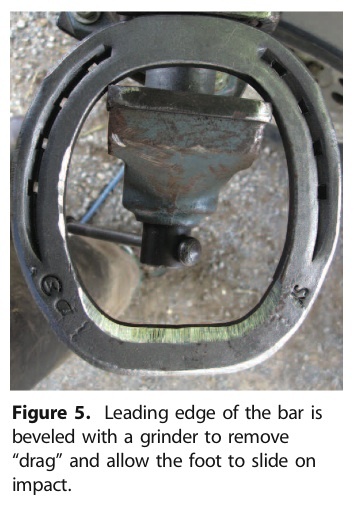 I exclusively use the Kerckhaert straight bar (Figure 1) for many reasons but especially for its ability to stabilize the hoof capsule and with the straight bar shoe there is no excess leverage applied to the heels which is often the case when egg bar shoes are applied. 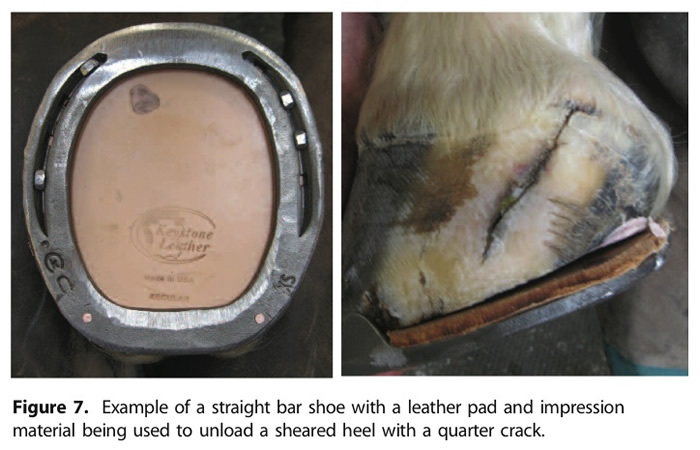 Some of the conditions I use a straight bar shoe for are palmar foot pain, sheared heels, quarter cracks, white line disease, distal phalanx fractures along with a continuous rim and any condition where the stability of the hoof capsule needs to be enhanced. The straight bar shoe is often combined with a leather pad and impression material placed in the palmar section of the foot to treat weak heels. Before fitting and applying a bar shoe, it is necessary to briefly discuss the trim. The trim forms the foundation for either routine or therapeutic shoeing therefore if the trim is not appropriate, whatever shoe is used will be less that optimally successful. In short, there are only three basic variables that can be altered by the trim, the depth of sole, angle of the dorsal wall, and mediolateral symmetry. The length of the wall at the toe is predicated on the depth of the sole; the wall is either level or slightly longer than the adjacent sole. The length of the heels is then predicated on the length of toe and the angle of the foot-pastern axis. Placed in practical terms, a line can be drawn across the widest part of the foot, the toe/quarters are reduced according to the sole depth and the heels are trimmed such that the heels of the hoof capsule and the frog are on the same plane. The proportions on either side of the line drawn across the foot should approximate each other (Figure 2). It should be noted that if the frog protrudes below the hoof wall following the trim, if possible, the horse is placed on a hard firm surface for 24 hours without shoes. This will place the frog and the hoof wall at the heels on the same plane before applying the straight bar shoe. The Kerckhaert straight bar shoe has a very good shape and can generally be fitted cold and finished with a grinder. This is certainly not to discourage the use of a forge. If the foot is distorted or if the proportions of the shoe need to be altered for therapeutic reasons, then the use of a forge becomes necessary. 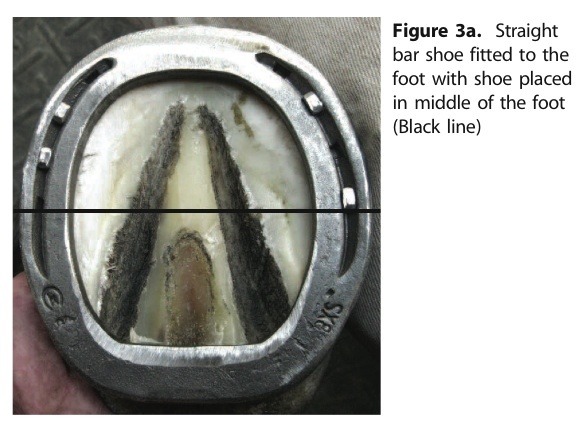 The shoe is fitted to the foot such that the line drawn across the widest part of the foot is located in the middle of the shoe and the bar is allowed to extend up to a half inch beyond the end of the heels of the hoof capsule (Figure 3A, 3B). This forms an excellent base under the heels. The shoe is back punched as necessary and additional nail holes are punched if needed. The shoe is now finished either by forging or using a grinder. 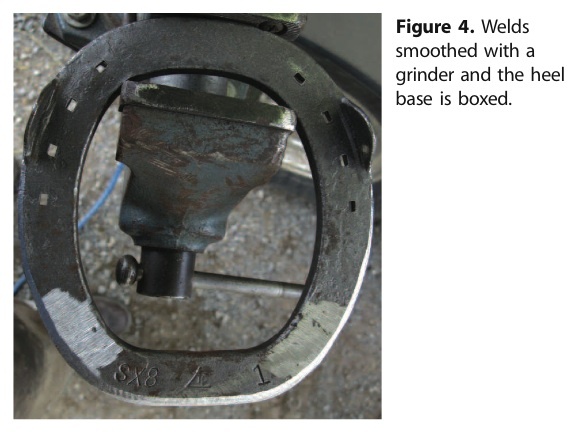 The welds used to attach the bar on the foot surface of the shoe are smoothed out so as to not interfere with the movement of the heels of the hoof capsule against the shoe and the outer perimeter of the foot surface of the shoe is boxed from one quarter to the other quarter to prevent the horse from inadvertently stepping on the outer margin of the shoe (Figure 4). It must be remembered to remove the leading edge of the bar on the ground surface of the foot to prevent drag during the landing stage of the stride (Figure 5). 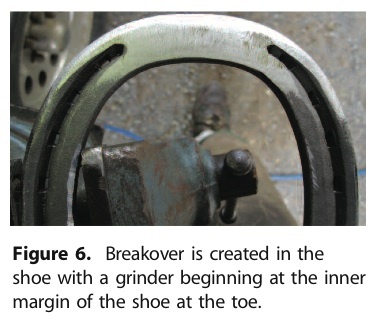 For enhancement of breakover, I use a grinder and start the roll at the inner margin of ground surface of the horseshoe at the toe and create a tapered roll from this point to the outer margin of the horseshoe such that the result will decrease the thickness of the outer margin of the shoe by half the thickness of the material (Figure 6). The shoe is attached to the foot using four nails of the smallest size possible that fit the holes punched in the shoe. An example of using a straight bar shoe would be for a foot with a sheared heel and a quarter crack (Sheared heels will be discussed in a future edition of The Natural Angle). The objective for this condition is to unload the sheared heel and allow the heel to descend into a more acceptable position. This can only be accomplished with a bar shoe. After the foot is trimmed as described above, the foot is lowered further from the quarter to the heel on the affected side before the shoe is attached. A leather pad is usually used with the shoe and impression material is placed in the palmar section of the foot except under the affected quarter and heel to further shift the load to the contralateral side of the foot and encourage the sheared heel to drop (Figure 7).